In one of our Basel 2014 reports Revolution’s Adi Soon presented the VIDEO about the new Louis Vuitton Escale World time already. An amazing looking and superb working watch, that was entirely produced in-house. (More about that later). Since the first Tambour watches were introduced in 2002, we have seen the Louis Vuitton watch collection growing and expanding. But 2002 was not the first year that the brand started to concentrate on a watch collection. The very first time that I discovered Louis Vuitton timepieces, was in 1988, when the brand launched the Louis Vuitton I and II watches. Vuitton often works with well known International designers, for their various product lines and in this case, both models were designed, for Louis Vuitton, by the Italian designer/architect Gae Aulenti. The production of the watches was done by IWC. Aulenti was a unique designer and besides her architectural work, she was responsible for famous products like the large ‘Pipistrello’ lamp, often seen in hotels or the ‘Tavolo con Ruote’, the glass table on weels. The Louis Vuitton I was, especially for that time, a very unique looking Worldtimer, housed in a gold case without lugs and a multi function crown at 12’o clock. Quite a departure since the watch scene was pretty traditional at that time. The strap was one long piece of leather, that slipped through a notch on the bottom of the watch. Naturally there were (a very Vuitton characteristic), a choice of different calf leather straps in the colours green, red, black or brown available for the watch. 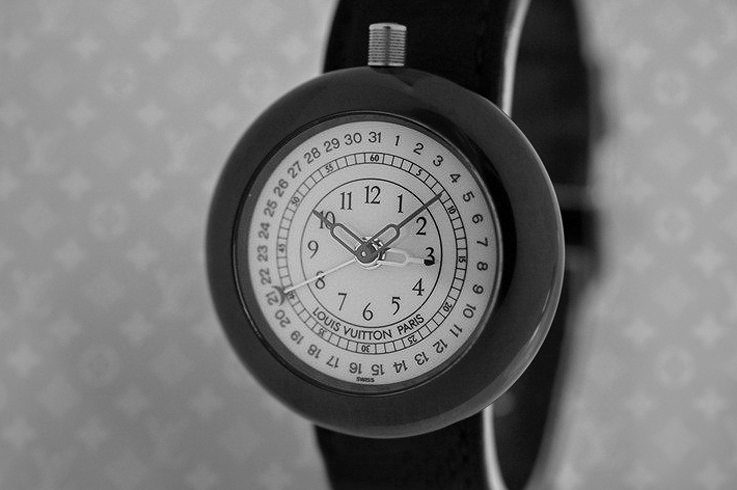 The Louis Vuitton II watch was a close sibling of the model I, smaller and less complicated. 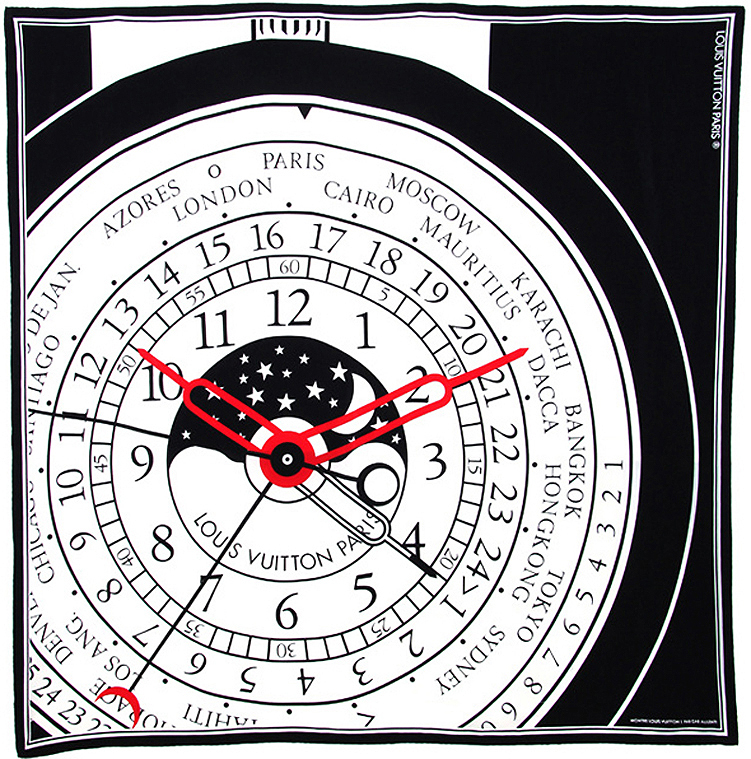 But it still had an alarm and a pointer date, what made the watch ideal for traveling. What the model II made really unique, was the case that was made of ceramic; a material that was hardly used in the eighties. 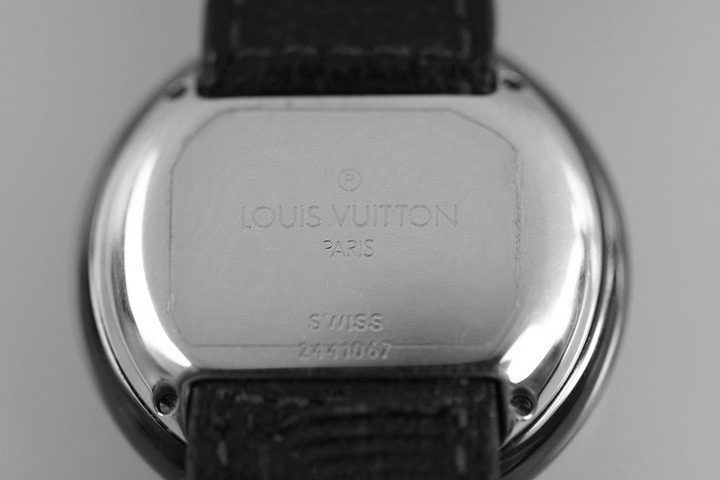 The Louis Vuitton II watch was produced in a shiny black or dark green 33mm case, and was a very remarkable time piece that Vuitton also developed in close corporation with IWC. 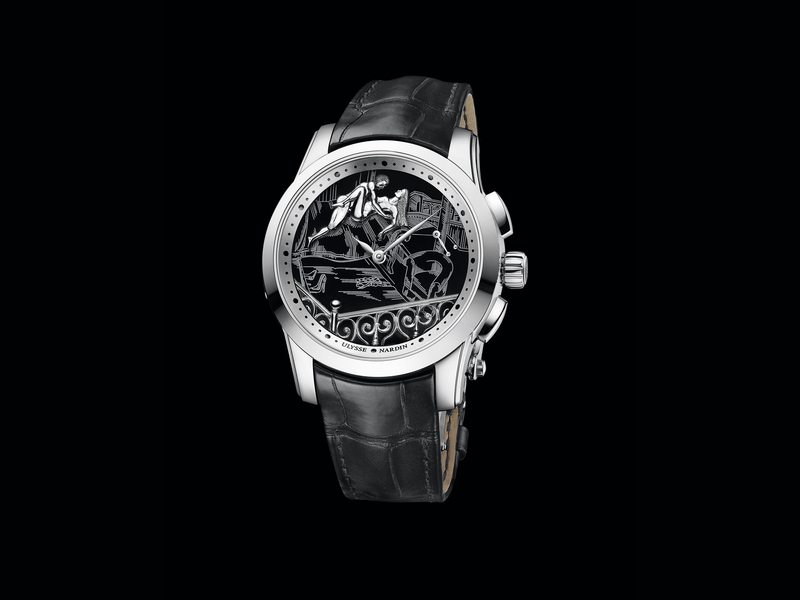 For a couple of years, La Maison had no time pieces in the collection, but in 2002 the Watch collection really took off with a launch of several different time pieces. Most models, like for instance the timepieces with a Chronograph- or an Alarm complication were housed in the ‘Tambour’ case, some others in the square ‘Speedy’ case. 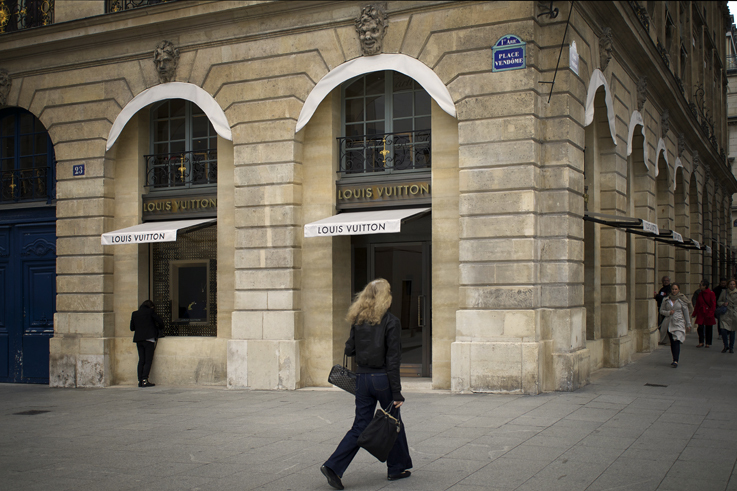 Louis Vuitton is keen in becoming strong competitor in high-end watch making; the company has its own Manufacture, where models like the Escale Worldtime, the Tourbillons and other complications are being produced and after earlier openings in China and Japan, the first Watch & Jewelry Store in Europe, designed by the trendy architect Peter Marino, was opened at 23 Place Vendôme in Paris, almost two years ago, after a long period of renovating and rebuilding. The interior of the store looks really cool and relaxed and it is the place to see Louis Vuitton’s high end watch collection. Personally I see Louis Vuitton as one of the hottest and most creative brands in the (multi product) Luxury Goods sector. The fact that Vuitton is able to collaborate with the best designers from all over the world, that are willing to work within the company’s House Style, proves how serious creative people take Vuitton, for what it is and for what it is doing. 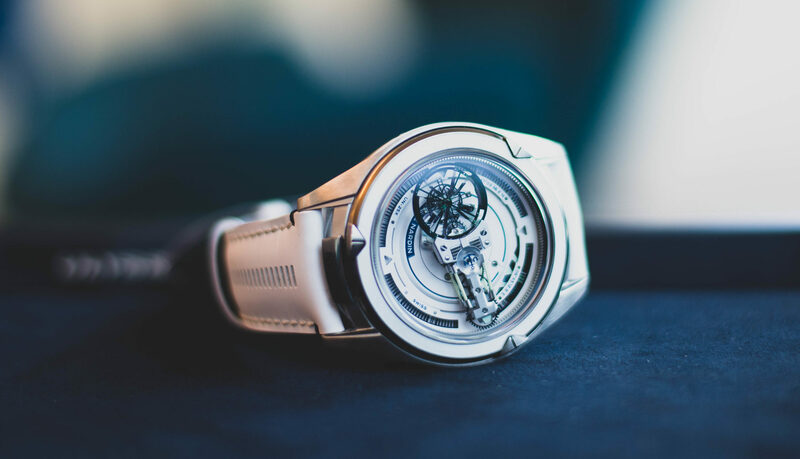 The brand has all the means to achieve their goals and I am sure, that in the time to come, Louis Vuitton will spoil collectors with more new and technically surprising timepieces. Besides the typical Tambour case, that I favour a lot, the brand presented a stunning new case design this year. So stay tuned; in due course we will post about the high end mens models that Louis Vuitton presented this year in Basel.